According to a study by student accommodation specialist GSA and ENBD REIT, the demand for higher education in the UAE has increased by 8.7 per cent annually over the past eight years, reaching 156,600 students. Aaron Maskrey, head of research at GSA, attributes this growth to a number of factors, including the effects of Arab Spring, which changed the traditional make-up of regional educational hubs. “Previously, many regional students sought education in Syria and Egypt, but now Dubai is seen as a stable and safe location, yet still close enough to maintain strong cultural and family ties,” explains Maskrey. With the UAE’s increasing number of international students, investors and developers are jumping at the opportunity to cater to a niche real estate segment. According to the Knowledge and Human Development Authority (KHDA), student enrolment grew by 4.5 per cent during the 2016-17 academic year, and 73 per cent over the past six years. The number of students from 31 higher education institutions within the education free zones has reached now close to 29,000. “These figures underline the potential for significant expansion in the coming years, however, the challenge for the sector is likely to remain: the availability of affordable residential accommodation outside of the campuses, particularly with residential rentals continuing to fall, with average rental down by around 4 per cent year-on-year,” says Mat Green, head of research and consulting in the UAE at CBRE Middle East. While the demand for student accommodation has grown exponentially, supply needs to catch up. For instance, at 4,000 student beds, Dubai currently caters to just 6.5 per cent of enrolled students, compared with 24 per cent in other more mature markets. This comes as a challenge as well as an opportunity. In fact, there is a perennial shortage of reasonably priced, convenient accommodation for students even in mature markets such as the UK and Australia. While there is a small number of purpose-built student accommodation (PBSA) in Dubai, much of the demand is accommodated within residential buildings separate from university campuses, including within more affordable locations such as International City, Dubailand and Dubai Silicon Oasis, says Green. Properties built particularly for students and in the vicinity of campuses are few such as the American University of Dubai (AUD) residential halls near Dubai Media City and Dubai International Academic City (DIAC) housing Heriott Watt and BITS Pilani, among others. Long-lease apartment buildings like that of Canadian University in Discovery Gardens and independent facilities like Uninest Residences are also meeting the demand for student accommodation. On the supply side, a shortage of beds comes as a challenge to institutes in drawing and retaining students. “I feel that provision of accommodation should be in the main priorities of the newly established universities,” says Suad Alhalwachi, CEO of Education Zone, an education consultancy firm in Dubai. Meanwhile, Maskrey expects the imbalance between supply and demand to continue to increase over the near future. This opens an opportunity for property investors looking to operate in a sector that will continue to be demand driven for a long time. “Newly enrolled students will need a convenient, safe and welcoming place to live and this is where the investment opportunity lies,” says Maskrey. In last couple of decades, PBSA has emerged as an asset class in its own right in traditional education centres such as the UK and the experience is being replicated in the UAE. As it aspires to be an international education hub, the UAE has all the makings of an emerging premier destination for PBSA investors. There are now first-movers such as ENBD REIT, which bought GSA’s first PBSA in Dubai earlier this year for Dh120 million, however, it remains to be seen how the sector endears itself to investors presently focused on traditional education markets. “We are constantly looking to invest in new real estate sectors in the UAE that offer strong long-term growth prospects. 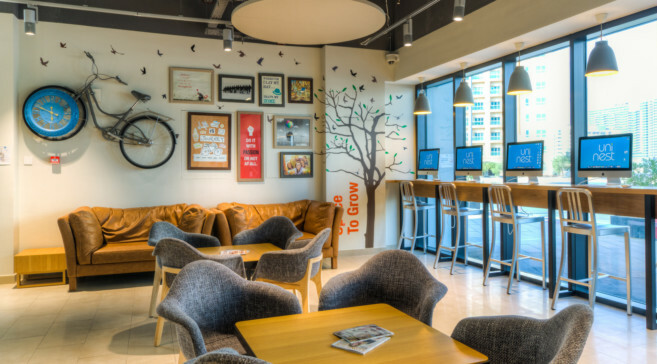 Student accommodation offers such an opportunity for us,” says Anthony Taylor, fund manager at Emirates NBD Asset Management, which manages ENBD REIT. As the PBSA segment expands, developers also need to cater to the students’ specific requirements, including proximity to schools, community amenities and easy access to transport. There is also demand for Sharia-compliant accommodation, including segregation of boys and girls. While some students are willing to shell out big amounts for high-end accommodation, most look for easy-on-the-wallet options. Furthermore, most students prefer to stay in cities or zones that have no restrictions on working part-time. Taking into account these factors, industry experts say it is much more difficult for universities to find accommodation for their students. The high cost of living close to the university is an added challenge for students as most traditional universities are centrally located, which means accommodation is generally more costly. Traditionally, universities all over would provide hostel accommodation in their own properties. With the exponential growth in enrolment of international students, universities started renting properties in bulk and sub-letting to their students. This has its own challenge of managing the properties, of which many universities are ill-equipped to do so. As such, there are now private operators managing student accommodation in the vicinity of the universities. But there are not many with the expertise to meet the students’ peculiar needs. “Student accommodation is a very specialised product, which performs better when built for purpose,” says Maskrey. Many inexperienced developers have tried to move in, but as Maskrey puts it, “valuable experience is missing in locational analysis, design efficiencies and ongoing management”. The shortage in student accommodation, therefore, continues to plague the education sector. Dubai has recently introduced new regulations that make the emirate more student friendly. Students are now able to work part-time, which is normal in all other traditional student markets and is very helpful in integrating students to the local community and culture. Dubai has also created a separate student accommodation zoning category, with reduced car parking requirements, as the majority of the residents don’t require private transportation. “Existing regulations have previously made residential developments easier for developers to execute, however, we understand authorities are working together with developers to address this,” says Taylor. Although GSA has found success with its first project, there are not many new successful investor or developers in the arena. But with Dubai moving towards becoming an international education hub, analysts believe the PBSA sector can expect a surge in private equity and institutional investment. On the other hand, investors from the GCC continue to invest in the UK market, which they find safe and stable with strong prospects. Knight Frank anticipates 2017 to be a record year for investment into UK PBSA, with £5.76 billion (Dh27.76 billion) set to be invested from across the globe, and the UAE accounting for a large chunk of this. Evidently, universities in the UAE need to work hand in hand with potential investors in PBSA, although there is not much indication that this is being realised. “There is no real coordination between the universities and the private providers,” complains Alhalwachi. However, given the demand for Sharia-compliant investments in the Middle East, and the significant volume of outbound capital into student accommodation in more mature markets in the US and Europe, Green expects institutional investment volumes to increase as the sector matures and as more and better-quality facilities are developed. Taylor says the goal should be to ensure a holistic approach in delivering quality education that can rival the best in the world. “The focus should be to provide world-class student accommodation to match the quality of the education offered,” he says.